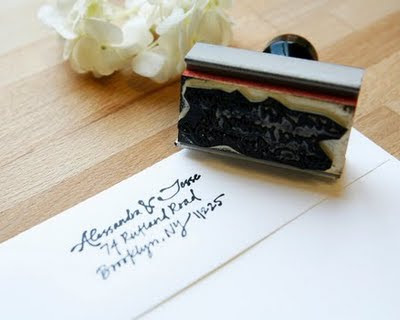 Personalized, calligraphy, looks-like-it's-handwritten address stamp. Wouldn't this be great with our brand-spankin'-new Nevada address? Serious like, indeed. You moved to NV? What's the plan to finish school there or continue your business there? We've had a crazy winter in Utah (not nuts as far as snow, just crazy in changing each day- 70 one day, snow another). Hope you are doing well.